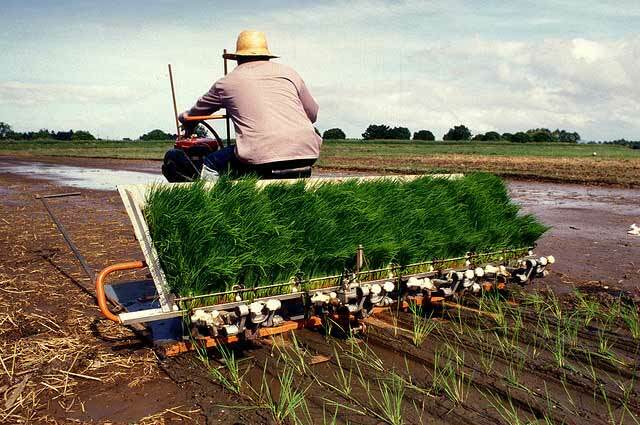 Machine transplanting of rice seedlings is less time and labor intensive, compared to manual transplanting. Other benefits are an improved seedling establishment and a uniform maturity. For the transplantation with the machine, seedlings are nursed for 12-15 days in advance. The fields should be well puddled, leveled and drained to prepare a good seedbed and to allow a proper operation of the machine. Greenhouse gas emissions are reduced through the use of machine transplanting because of a reduction of cultivation time and improving water-use efficiency. It is most effective in combination with laser land leveling, which reduces the amount of time and volume of water needed for irrigation. Through a better plant establishment, a higher yield quantity can be achieved, which is resulting in a lower emission per yield unit.